We offer proctoring services. The fees for Comstock residents is $10 per exam and $25 per exam for non-residents. Click here for more information. The application is available here. We now have tutor rooms and Wi-Fi available! Call 345-0136 for more information. 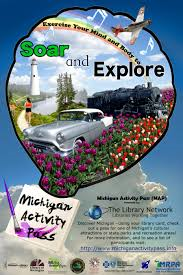 Michigan library patrons can get into Michigan's more than 230 state parks, historic sites, forest campgrounds, recreation areas for free, receive a personalized tour or get a discount in museum shop. Have extra skeins of yarn? We are now accepting donations for our Lap Robe Project. If you are interested in helping us crochet and/or knit for this project, please contact Myla or Barb at the library. 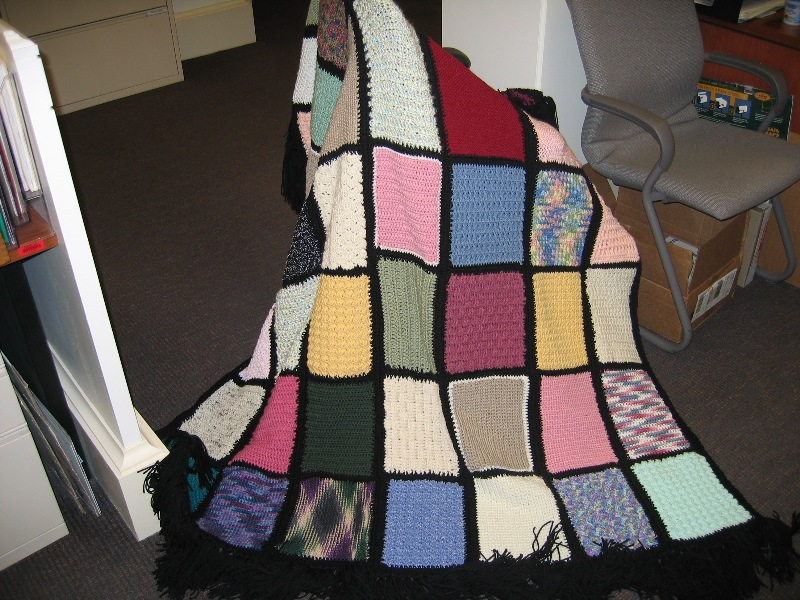 The Comstock Township Library donates lap afghans to area hospices and nursing homes. If you have left over yarn from other projects this is a perfect way to use it up. We assemble knitted or crocheted blocks,7”w x 9”l, into lap afghans that are approximately 35x45 inches. This is an ongoing project so rectangles can be donated at any time. We also gladly accept donations of yarn, or completed afghans. For more information please contact Myla or Barb at the library. with our Preservation Station. Transfer VHS tapes to DVDs. Call for more information. We now have a notary service at the library during business hours. The cost is $5.00 per notarial transaction. Call 345-0136 for more information. We have a fax service! Must use credit or debit card to send. Now Available: OverDrive and HOOPLA! Download free audiobooks and e-books from home using your computer, MP3 player, e-book reader, and other compatible devices. Computer Help: Have a question about the computer? Would you like to learn how to use the computer, download eBooks, use M.S. Word, M.S. Publisher, M.S. Excel etc.? Please call 345-0136 to "Book-a-Librarian" for one-on-one help. Must be a Comstock Library cardholder. Need Resume Help? Please call to schedule an appointment or visit the adult reference desk to do so. We will help you construct a cover letter or resume, or just proofread one that you already have. Call 345-0136 for further information. Would you like to learn how to research genealogy using Ancestry Library Edition? Please call the library 345-0136 to set up an appointment with a librarian. The Homebound Delivery Service seeks to provide library materials to Comstock Township Residents who are unable to visit the library according to the criteria below. Homebound delivery includes the selection of materials by library staff and delivery of those materials by library employees. Residents are to be considered homebound if they have a condition (due to illness or injury) that restricts their ability to leave their place of residence, except with the aid of a supportive device such as crutches, canes, wheelchairs, and walkers, the use of special transportation, the assistance of another person or if leaving home is medically contraindicated. In most circumstances, if a resident drives, he/she would not be considered homebound. Call 345-0136 for further information.